An easy way of flipping the Okonomiyaki will be instructed in the lesson. The fillet is nicely minced in a mortar to keep a fluffy texture. You will be surprised at how good the minced fish balls come together with the golden soup stock. A superb way to end any meal is with green tea pudding! 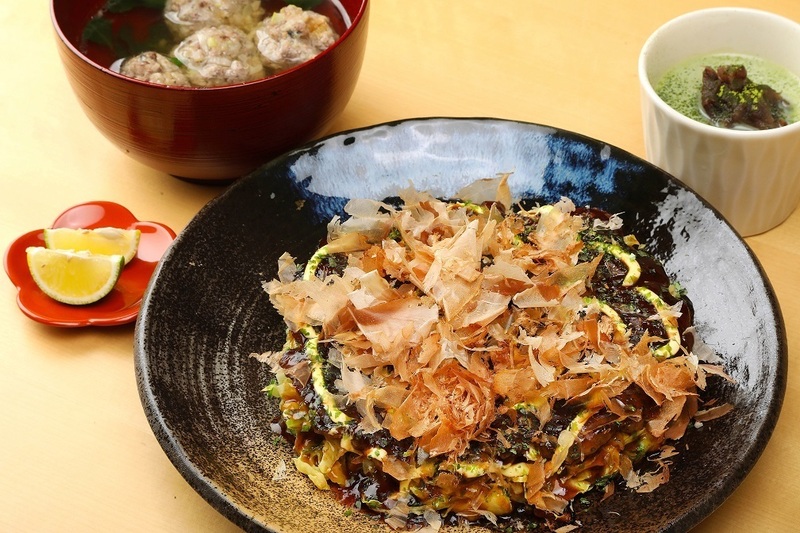 ※Okonomiyaki can be replaced with Takoyaki. ･ We promote a family enriched environment, so we encourage you to bring your children along to enjoy the experience. However, we are not accepting any male only groups. ･ Cooking class Fee for children aged 12 or younger will be JPY 5,600.00-. ･ Resevations will be accepted no less than one week prior to the scheduled lesson date. ･ Cancellations will not be accepted. ･ Please be aware of the lesson start time and be on time. We want to avoid any disruptions or distractions, which will have a negative effective on delivering a great experience. ･ Filming during the lesson is prohibited. ･ For sanitary purposes and preventing stain to your clothes, a traditional Japanese style apron called “Kappougi” will be provided for you to wear. Please wear it during the lesson. ･ Please, pay attention and beware when you use a sharp knife and avoid from burning yourself. ･ All the material received through this course cannot be redistributed, reused at other cooking school, or is prohibited from being posted on-line containing or showing company name and or logo. ･ Any left-over of the food cooked at the lesson cannot be taken out. ･ Smoking is prohibited in the class.